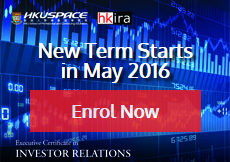 Around 300 Hong Kong-listed companies have been nominated for the HKIRA 2nd Investor Relations Awards 2016. The Award Conference and Presentation Luncheon will be held on 25 May 2015 (Wed) at the Conrad, Hong Kong. Book your seat with early-bird discount of 10% off now! HKEX supported the Hong Kong Investor Relations Association's (HKIRA) first-ever roadshow in the Mainland as the HKIRA took a delegation of Hong Kong-listed companies to Shanghai to meet with leading Mainland brokers' research houses. The two-day (14 and 15 April) roadshow brought together senior management of 25 Hong Kong-listed companies with shares eligible for trading through the Shanghai-Hong Kong Stock Connect programme (Stock Connect) and over 150 research analysts from 16 leading Mainland brokerage firms. Congratulations to Mr. Peter Lam, the 1,000th successful candidate achieving the Certificacte in Investor Relations (CIR) Program of the UK IR Society!,The CIR program is firmly established as a leading IR international professional qualification. "Risk Management and Internal Control Under the New Corporate Governance Code"
"How to Communicate Bad News to Investors"
Seminar: "How should capital markets participants react to abnormal market volatility?" Seminar: "RMB and China Equity Market Outlook"
"How Investor Relations Drive Stock Price?" "How Investor Relations Enhance Corporate Value?" Seminar: "Investor Relations: a Career Option for Financial Market Professionals?" Hong Kong Investor Relations Association (HKIRA) is a professional association comprising IR practitioners and corporate executives responsible for communications between corporate management and the investment community. Established in 2008, HKIRA advocates the setting of international standards in IR education, promotes best IR practices and strives to meet the professional development needs of those interested in pursuing the investor relations profession. HKIRA is dedicated to advancing the practice of IR as well as the professional competency and status of our members. To date, HKIRA has over 400 members and most of them are working for companies primarily listed on the Hong Kong Stock Exchange. HKIRA's membership profile covers a wide spectrum of professions from IR, finance, accounting, company secretarial to corporate investment roles. It consists of executives at various stages of their career, including the top executives from the IR professional and also the C-level management of listed companies.